It is no surprise that Benalmadena property is such a massive hit with property buyers that want a home on the Costa del Sol within easy reach of the airport and with all the amenities that Benalmadena has to offer. Less than 12 km from Malaga Airport and 40 km from Marbella, the municipality of Benalmadena has three main urban areas; Benalmadena Pueblo, Benalmadena Costa and Arroyo de la Miel. Benalmadena offers a wide choice of properties from beachfront holiday apartments to luxurious sea facing villas. 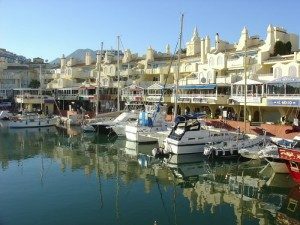 The town is split into two main sections with Benalmadena Costa the part of most interest to the many tourists who visit this popular Costa del Sol resort every year. Benalmadena Costa is a purpose-built coastal resort extending 8km along the coast which climbs steeply up into mountains behind. Higher up the side of the mountain is Benalmadena Pueblo which is still an attractive old Spanish village with it’s whitewashed houses on cobbled streets. Next to the Pueblo you will find the village of Arroyo de la Miel which translates to ‘Honey Stream’, a former Andalucian village, which now links Benalmadena Pueblo to its Costa. Arroyo de la Miel has grown into a fantastic area for dining and shopping to your hearts content. The Benalmadena train station is located in Arroyo, which links the town all along the coast from Malaga to Fuengirola. One of the many reason that Benalmádena has gained tremendous popularity is because it hosts the famous Tivoli World and the Renfe Railway Station at Arroyo de la Miel. The award-winning Puerto Marina yacht harbour offers a wide variety of restaurants, a number of bars and shops and the Sealife Centre. The wide and spacious promenade is backed by a long line of superb cafés, bars and restaurants, and fronted by 8km of blue flag beaches. If you are interested in buying a property in Benalmadena you will find a wide selection of apartments, townhouses and villas on our web site, or contact us if you are looking for any specific type of property or business.